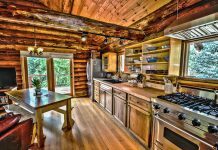 When choosing an oven, you need to consider several factors. First, it is important to consider your budget to determine how much you are willing to spend on a range. Once you have determined your budget, then a few questions remain: Do you use the oven extensively? How important is the look and style of the range? And finally, is the performance of the cooktop important to you? Anyone looking for a new oven would do well to consider the Kitchen Aid Kfgg500Ess. What Is the Kitchen Aid Kfgg500Ess? Once you have answered these questions, selecting a range is relatively easy. 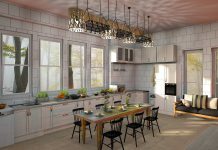 The kitchen range industry is a very competitive market today; therefore, you will find several great products that will fit into almost any budget. In this article, we will review the Kitchen Aid Kfgg500Ess. We will take a closer look at its features, design, price, and style. We will also compare it to some similar products on the market to see how it stacks up. 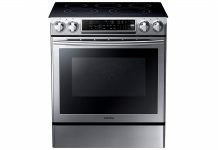 The Kitchen Aid kfgg500ess is a mid-price, free-standing gas range manufactured by Kitchen Aid. On first glance, this range lacks some of the aesthetics other many other similarly priced gas ranges. The design is somewhat basic even for a free-standing model. The cooktop features four main burners and a fifth center burner. The cooktop also features two continuous cast iron grates. Unlike many other gas ranges, there is no way to use a third grate or griddle with the center burner as it is covered by the two standard grates. The burners are rated from 5,000 to 18,000 BTUs with the front two burners being high powered burners. The cooktop controls are front mounted and have more of a unique round shape rather than the traditional knob appearance. The oven controls are rear mounted on a touch panel that functions like a smartphone. This user interface is designed to be very responsive, unlike most oven panels that can take two or three attempts to push the buttons that you want. The oven features a 5.8 cubic foot capacity, seven rack positions, and broil and roast settings. Also, the oven features a convection fan for more even cooking and reduced cook times. Also, Kitchen Aid has designed a conversion system they call "EasyConvect" that automatically converts conventional baking times to convection times which takes the guesswork out of unfamiliar dishes. The oven also features the "Aqua Lift" self-cleaning system that uses low heat and water to clean the oven in about one hour. There's no more extremely high heat and bad odors from a self-cleaning oven! Also, the baking element is hidden making cleaning much easier. The cooktop performance is outstanding with very fast boil times and precise temperature control. The only drawback of the cooktop is the unusual design of the center burner making it relatively useless unless you're using a large griddle that covers the entire cooktop. The oven's performance is also very good. Burgers, biscuits, and chicken are cooked to perfection in this oven in no time. If you value performance over style and are willing to overlook the issue with the center burner's design, the Kitchen Aid kfgg500ess is a good choice. 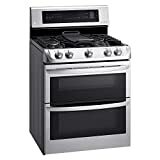 The Kitchen Aid Kfgg500Ess is a 30-inch free-standing gas range. The exterior is wrapped in stainless steel, and the cooktop features five burners. The cooktop burners range in power from 5,000 BTUs to 18,000 BTUs. Two cast iron continuous grates cover all five burners on the cooktop. The oven capacity is 5.8 cubic feet with seven rack positions. The oven burner is rated at 18,000 BTUs of power and features bake, broil, and roast settings. The oven also features convection cooking, and a self-cleaning function that uses steam and low temperatures to clean the oven compartment. This free-standing range is designed to fit into any standard 30-inch counter space. The Kitchen Aid KFGG500ESS is priced right around $1,300 which puts it in mid-price range for a free-standing gas range. Aside from the basic design, the features and performance of the KFGG500ESS make it a very good value at this price. The KFGG500ESS is priced at about $1,450, making it a good value when considering the performance and features this range offers. The KFGG500ESS by Kitchen Aid is very easy to use with its responsive oven control panel and self-cleaning oven. This range is very user-friendly. Performance is where the KFGG500ESS sets itself apart. The powerful cooktop front burners boil water very quickly and the cooktop controls temperature very precisely. The oven also features some of the fastest bake and roast times we have seen. While the features and performance of the KFGG500ESS are very good, the visual appeal of this range is minimal. This range has a very basic look that may not blend with some kitchens. Kitchen Aid offers a one-year limited warranty on this range which is the industry standard for this type of product. 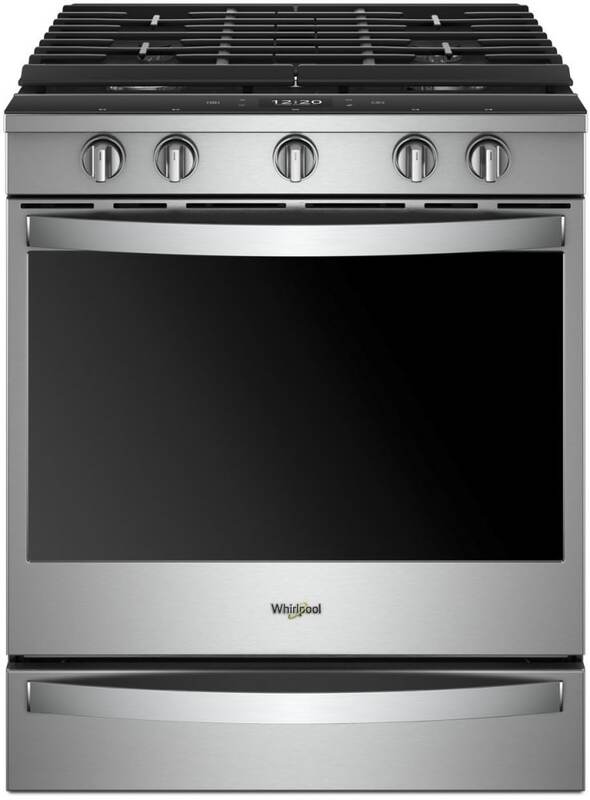 The Whirlpool WEG750H0HZ is a 30-inch slide-in gas range manufactured by Whirlpool. The cooktop features five burners with a long center burner and included griddle burger, pancakes, or fajitas. The cooktop burners range from 5,000 BTUs to 17,000 BTUs of power and the burners are covered by two end-to-end cast iron grates that make moving cookware around very easy. The oven features an overall capacity of 5.8 cubic feet and features a single convection fan. The oven has bake, broil, and roast settings as well as a convenient self-cleaning feature. The controls are front mounted with the cooktop burners being controlled by stainless steel knobs, and the oven is controlled by a touchscreen user interface. This range is compatible with Whirlpool's "Scan-to-Cook" technology that allows you to scan a barcode with your smartphone and send cooking settings to your oven. This range has a very sleek and stylish design and performs very well. Overall, this model is a bit more expensive than the other models we are reviewing, but its features, style, and performance make it an excellent buy. This Whirlpool range is priced at around $2,150 making it rather expensive in comparison with the other models we have reviewed. The WEG750H0HZ is very easy to use with its intuitive touchscreen user interface and smartphone-compatible technology. This range is loaded with features to make your life easier. This Whirlpool range performs very well with fast boil times, precise temperature control, and excellent oven performance. This is a very well performing range. The WEG750H0HZ is very well designed. The touchscreen user interface and "Scan-to-Cook" technology are two of the features that make this range stand out. The oven capacity is average, but that's really the only drawback. Whirlpool offers a limited one-year warranty on this range. 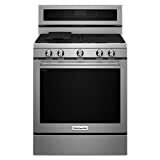 The Kenmore Elite 76033 is a 30-inch free-standing gas range manufactured by Kenmore. The 76033 features a five burner cooktop with two cast iron grates and an additional griddle that can be used with the center burner. The cooktop burners range from 5,000 to 17,000 BTUs in power. The 76033 features a dual oven configuration with a total overall capacity of 6.1 cubic feet. The upper oven is 2.2 cubic feet, and the upper oven is 3.9 cubic feet of space. The oven features a convection fan, self-cleaning mode, and bake, roast, and broil settings. The controls for the cooktop are front mounted, and the oven control panel is rear mounted and features a push button design with an LED display. The Kenmore Elite 76033 has a stylish look which will blend well into most kitchens. The oven's cook performance is very good—the cooktop boil times are fast and temperature control is very precise. Overall, the Kenmore Elite 76033 is a well designed range that's performance won't disappoint. The Kenmore Elite 76033 is priced right around $800 to $810, making it a mid-priced gas range with features of a more expensive model. This range is very easy to use with its dual oven design that makes baking multiple dishes a breeze. Also, the included griddle is great for cooking burgers or pancakes on the cooktop. The Kenmore 76033 has excellent cooktop performance with fast boil times and excellent temperature control. The oven's cooking performance is also very good. This is a very well-designed range that is sturdy but stylish. It has a dual-oven configuration that makes life easier on someone that uses the oven extensively. Kenmore offers a limited one-year warranty with this product. The LG LDG4315ST is a 30-inch double oven free-standing gas range manufactured by LG. The cooktop features five burners with two cast iron grates and a removable griddle for the center burner. The cooktop burners are rated from 5,000 BTUs to 18,500 BTUs of power. The oven has a total capacity of 6.9 cubic feet. The controls for the cooktop are located on the front and the oven controls are rear mounted on a push button panel with an LED display. Also, this range features LG's "Smart ThinQ" technology that allows the oven to connect to a smartphone app for cook settings and other features. Ultimately, the LG LDG4315ST features a stylish design with good smart features but falls short on overall performance. The LG LDG4315ST is priced right around $1,800 to $1,850, making it somewhat more expensive than most free-standing ranges, but with smartphone connectivity, the price tag is understandable. This range is very easy to use with its dual oven and self-cleaning feature that make kitchen chores less of a hassle. The oven's performance is somewhat disappointing with uneven heating and slow cook times. 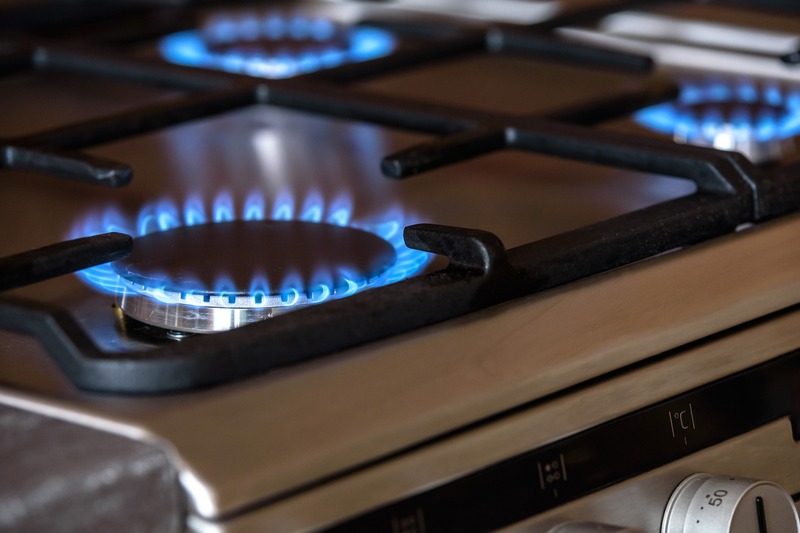 The cooktop performance is better, but only average when compared to other free-standing gas ranges. It won't be too hard to find a less expensive oven with better cooktop performance. This range has basic look to it; however, the cooktop is very well designed with an elongated center burner with removable grate and griddle accessory. The most disappointing issue regarding design is that the smartphone app leaves lots to be desired. This is especially unfortunate considering that the smartphone compatibility is likely a big reason for this oven's larger price tag. LG offers a limited one-year warranty with this product. The Kitchen Aid Kfgg500Ess is a very well designed range that has a somewhat basic look to it, but the features and performance make this range a good buy. If you are in the market for a gas range and value performance more than looks, the Kitchen Aid Kfgg500Ess is a good choice. The Kitchen Aid Kfgg500Ess is a very well designed range that has a somewhat basic look to it, But the features and performance make this range a good buy. Previous articleWeg745H0FS: A Review of Products on its Specification!